New single belt retractable ratchet, the single piece construction allows you to walk the belt around the appliance. After use simply unhook the belt and the strap rewinds into truck. We have made the belt and spring system replaceable. Easy to use and affordable. Proudly made in the USA! Don't risk straining your back moving large appliances! 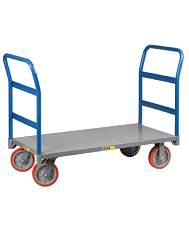 Let Dutro appliance hand trucks do the lifting for you. Move everything from washer, dryers, refrigerators, ranges, sofas, and more.